Hearts falling in LOVE! 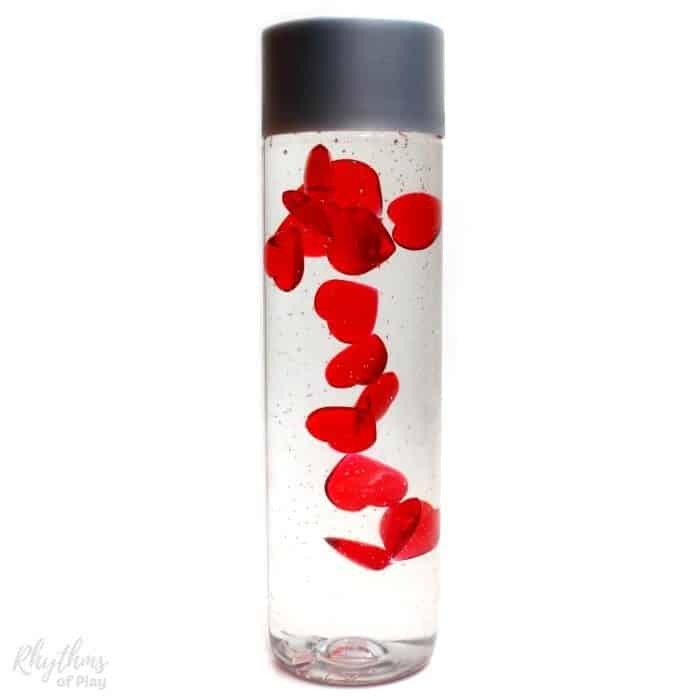 A DIY slow falling hearts sensory bottle is a calm down bottle or a simple gift to say I love you. It also makes a great discovery bottle for toddlers and kids of all ages to engage in safe no mess sensory play. 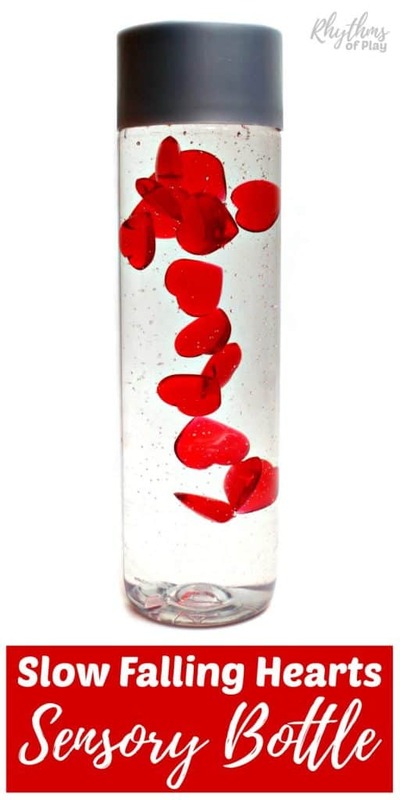 Simple tips to turn this sensory bottle into a Valentine’s Day gift are included below. To learn more about sensory bottles check out Calm Down Sensory Bottles 101. Grab a bottle out of the recycle bin with a large enough opening for the hearts. Peel off sticker. Use Goo Gone to remove sticky residue. Pour 1/2 cup of tap water into the bottle. Fill the bottle up the rest of the way with clear liquid hand soap. You want to fill it all the way to the top so there is no air in it. Different hand soaps have different viscosity levels so you may need a bit more or less water. When in doubt, wait to see how your bottle moves before you top it off with more hand soap or more water. Place the lid on the bottle and shake it up. It will be a bit murky until the contents mix and settle. Soap and water make bubbles 🙂 Afterwards, it will stay clear unless you give it a really good shake, then you may have to wait for it to settle again. 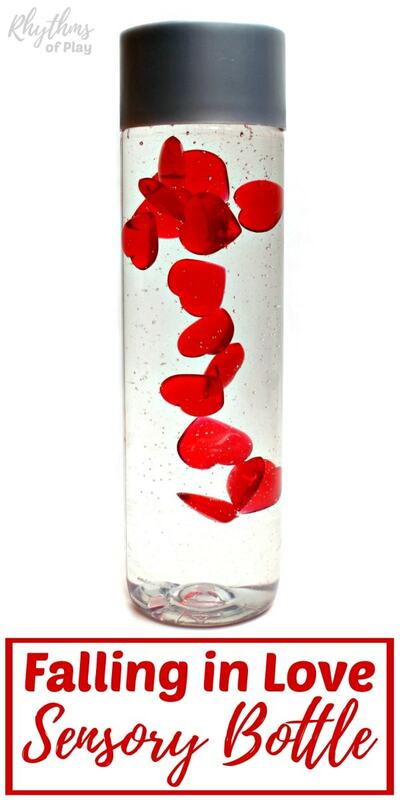 Play with this slow falling hearts sensory bottle for a day or two to make sure you like the way it moves. If you want the hearts to fall faster, add a bit more water. If you want the hearts to fall slower add in some more clear liquid hand soap. 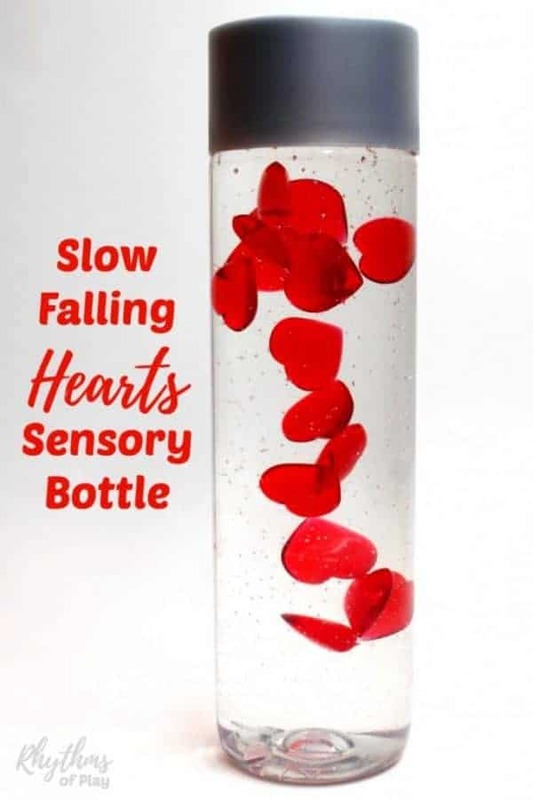 Slow falling hearts sensory bottles would make great Valentines to give to friends, family, classmates, or co-workers. They also make a simple Valentine’s Day gift for couples. To turn this sensory bottle into a Valentine’s Day gift or gift to say “I love you” any time of the year, try any one of the easy ideas below. Place one of THESE stickers on it. Any other message you can think of! 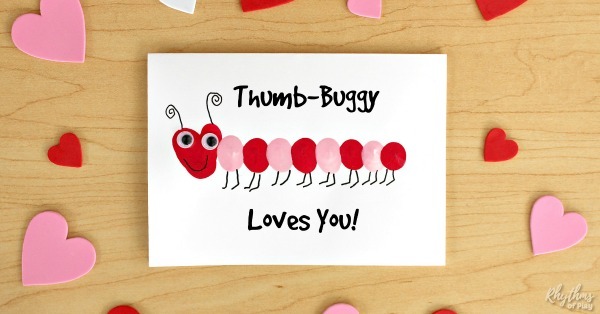 Make a fingerprint love bug card to complete the gift. Click on the link to see all of the fun card message ideas you can use! Not giving it away as a gift? Discovery bottles like this slow falling hearts sensory bottle can be used for no mess sensory play, as a calm down jar, or a meditation technique for children. You may also like this collection of gift ideas for him and for her, or, Valentine’s Day keepsake gifts kids can make. Just click on the links to see them all! I love this sensory bottle! A great calming and relaxing visual. Thanks! My daughter really loves it too! She took it with her to bed last night-ha! Love this! The slow moving hearts are a great idea! Thanks! My daughter and I had a blast putting it together. I love that making them is a great science lesson! Would foil hearts work too? No, I’m sorry, it wouldn’t. You would need to use something with a little weight for it to work with these ingredients. You can use foils to make a sensory bottle with about 1 to 2 cups of water and either corn syrup, glitter glue, or clear glue, but the paints on foils will chip off over time and float in the bottle. Where does someone get the hearts from? I assume from a craft store but which dept? I don’t ever go into a craft store. Hi Jane! I have never been able to find the hearts I used in a store. I purchased them on Amazon. I have provided the affiliate link to the “RED” hearts I used in the “Materials” section above. Click on either “RED” or the “PINK” to be taken to an Amazon sales page. I just bought them at the dollar store. Yes!! I just saw them at the dollar store as well. I couldn’t believe it! I’ve NEVER seen them there before!! I found them in both pink and red… Grab them quick because they won’t last long! Handsoap is much more viscous than water so it helps slow down the hearts so they don’t just fall to the bottom of the bottle. If you only use water the hearts will not move slowly and appear to float. Hi, I’m trying to make a few of your sensory bottles and just can’t get the right flow. How do you get the soap and water to stop making suds? I’ve used corn syrup in one bottle as well, but I struggle to get them to fall like yours. I’ve played with different parts water to corn syrup and water and soap (different bottle). I even tried glue but that just made all my sequins stick together! Hi Abby! I’m so sorry that you are having trouble. It’s best to top off your bottle. Fill your sensory bottle all the way to the top with liquid hand soap or water. Slowly let the bubbles pour out as you fill it up in the sink. Next, put the lid on the sensory bottle and allow it to settle. This method always works for us. When using glue it is best to mix it and the glitter with hot water, otherwise they might stick together. This is why we pre-mix in a quart measuring cup. I hope that helps!! Hi Cheryl, as you can see I have made a lot of calm down sensory bottles and jars as well! I have never tried white glue to stop the bubbles. I have always used clear glue and handsoap in various combinations. Thanks for the tip! I find that taking all the air out keeps the bubbles at bay! I added half cup of water and filled up with soap thye not floating but going down really fast, just made them maybe waiting 24 hours will make it better? Hi Aga! Sorry about the discrepancy… 1/4 to 1/2 cup of water works, more water makes the hearts move faster, while less water helps them move slower. Make it how you like it!